We stock asphalt shingles made by IKO. We have various colors available in both the 3-tab design, as well as the architectural. Just stop by the store to see color samples. The Deck: The deck refers to the wood surface that the shingles are fastened to. On older homes, the deck is made of boards, usually with a tongue and groove. Houses built more recently use plywood, usually of the CDX variety. Felt Paper/Ice Barrier: The layer that goes on top of the deck is an ice barrier. On a steeper roof, the three feet closest to the gutters are usually a rubberized ice and water shield. The rubberized barrier stands up to the ice a little better, and this is the area that is most likely to have ice back up under the shingles. The barrier protects the deck from the water and helps stop it from rotting out. The majority of the roof is covered with felt paper (usually "15 pound" felt) for the same reason. Since there is less chance of ice backing up under shingles nearer to the peak, the rubberized ice and water shield is not necessary there. Drip Edge: Drip edge, or T-Drip is a metal edging that covers the deck, and helps draw the water from the surface of the roof into the gutter system. It is usually made of aluminum (so that it won't rust out quickly), and goes under the shingles and ice barrier. This is so that when water hits it, it will slide off of the top and not try to slide underneath to the vulnerable wood deck. 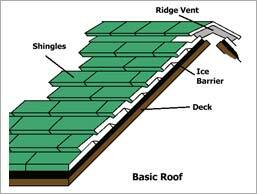 Shingles: The topmost layer are the shingles. On steeper roofs, a standard shingle or an architectural shingle are fine choices. For roofs that are more flat, rool roofing is a better choice, because it seals against standing water more effectively. 3-tab: This refers to a standard design of asphalt or fiberglass shingles. There are two cuts in the edge that is exposed to the weather. When this is overlapped by other shingles of the same cut, when you are done they look like separate shingles. Since the two cuts make three tabs, that's what they're known by. Architectural Shingles: This is a style of asphalt or fiberglass shingles that has a shadow design. It is thicker than the 3-tab shingles, and does not have notches cut through the shingle. Instead, there are usually two layers, with the stone on the top of the shingle embedded in a pattern that resembles shadow lines on the roof. They definitely give your roof a different sort of look. 15 Pound Felt: This is what is often also called "tar paper". It is the layer that is under the shingles, but over the plywood deck. The name "15 pound" used to refer to the weight and thickness of the felt, but over the years, it has slowly become thinner. So, it is not quite the same product as what was once used, but it is still used on most roofs. T-Drip: T-drip is the metal edging that is put around the roof to keep water from sneaking underneath the shingles and causing a lot of water damage. It also helps the flow of rainwater off of the roof, and into the gutter system. T-drip is most often made of aluminum, and we stock it in 5" and 8" sizes, in three colors: White, Brown, or Mill(/aluminum). Ridge Vent: Despite what you might think of heating costs, you generally must ventilate your roof so that there is not a build-up of heat inside the attic on hot summer days. This heat could melt the shingles or lead to other heat-related complications. One way to vent without heating the entire neighborhood is to use a ridge vent. It runs the length of the house at the very peak of the roof, and is often shingled over so that it matches, but still lets out heat and keeps out insects. We stock several kinds of these vents, including the old style metal ridge vent, CoraVent (a rigid black corrugated vent), and Roll-Vent.